Only a few fashion designer have the insight and ability to combine high fashion with high technology. Di Mainstone is one of the shining stars of the Haute Tech Fashion. Her journey through the world of fashion and technology is mysterious at times, her work full of mystical elements that surprise and captivate the audience.Di Mainstone is trained in fashion design at Central Saint Martins College of Art, London. Her interactive couture garments playfully explore human behavior by weaving soft-technologies into a fashion aesthetic. Diâ€™s eccentric style caught the attention of press and celebrities during a design partnership with cult UK labels Soochi and Choosi. Her attire sold internationally at established boutiques such as Harvey Nichols, Selfridges and Urbanoutfitters. 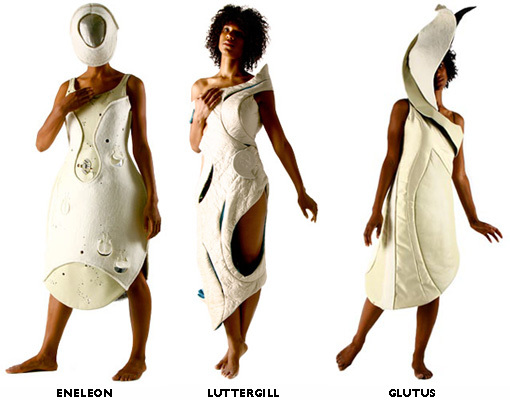 In 2005, Di joined Sara Diamond at the Banff New Media Institute to create a series of electronic couture garments. 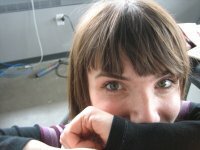 She quickly found her new passion for electronic textiles and teamed up with Joey Berzowska at XS Labs. Together they produced Scorpions, Diâ€™s Haute Tech range which has been exhibited during many high profile event on Wearable Electronic and Interactive Fashion. My personal favorites are her designs for the Skorpions project, a range of interactive garments that use shape memory materials to change the shape = look of the garments dynamically as a reaction of the wearer and the environment. SKWRATH is the model I give 5 stars (see image above). It is a quilted leather bodice, constructed out of stony leather lined with blood red silk. The abdomen is made up of three interlocking leather segments or plates, embroidered with threads of shape memory alloy, which are activated through a electronic board to contract and curl back to reveal deep slashes of red silk. ENELEON is constructed out of heavy hand-made felt, creamy leather, and reflective lamÃˆ lining. It is shaped like a large bilateral symmetric pod that encloses the body from front and back. Each side features six scattered scales that rise and lower in order to reveal a mirrored lining. The movement is activated by beaded shape memory alloy coils, controlled through the integrated electronics. LUTTERGILL is built out of soft quilted cotton with an elegant, cocoon-like silhouette, stitched to mirror the contours of the female form. Several seams slowly roll open and peel apart to reveal and release slices of iridescent color. The movement of these gill-like details is enabled by filaments of shape memory alloy stitched into the inside of the fissures. GLUTUS is an elegant off-the-shoulder dress that uses a combination of silk, leather, and felt to outline a streamlined, organic silhouette. A sculptural panel of leather attaches to the left breast and swoops around the right shoulder and the face to become a large leaf-shaped hat. The hat is embroidered with filaments of the shape memory alloy Nitinol on the top and the underside, so that the leaf can curl up and down around the head, as if trying to envelop and consume the face of the host. Di created an impressive and mysterious range of, letâ€™s say â€˜conventionalâ€™ fashion in term of Wearable Electronic but also and thatâ€™s closer to our topic, interactive garments. Too much to show all of it here, so hop over to her site and explore more about the work of Di Mainstone, the shining star of Haute Tech.